I moved from New Zealand to Saarbrücken to work at Saarland University in 2015. I had been warned by friends that if I wanted to learn German in Germany, I would have to be persistent and pushy to get people to converse with me in German, as most Germans speak excellent English. But fairly soon after arriving, I realised that being in an area so close to the French border would place me in a good environment for learning German. 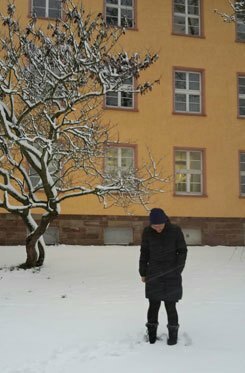 Snow outside my work building, Saarland University, a novelty! | © Carolyn Wu Once shop assistants could see I didn’t speak German, they asked if I could speak French – “Französisch?” – and then shook their heads at my “Englisch?”. I had been told that the working language in my research unit would be English, but I could see the advantage of being able to communicate in German in order to integrate with my team. It took some time to be confident enough to use my German at work. With the encouragement of friends and colleagues, I persisted! By the time I moved to my current post in Bielefeld, after almost two years in Germany, I was confident enough to participate from the get-go in conversations at the university canteen, mistakes and all. © Carolyn Wu This helped establish quickly that I want to keep learning and speaking German, and my colleagues are used to me using German, however bad it may be! One thing I really love about language learning in Germany is Language Tandem. I'm not talking about learning vocab on a two-seater bicycle, as one my friends assumed. No, this kind of tandem involves pairing up with someone who speaks another language and meeting regularly to converse in both. My tandem partner and I agreed to meet for breakfast and if the language tandem-ing didn’t work out, well, it’s nice to meet up for freshly baked rolls and other treats anyway! In the beginning, as I expected, it was tough. Really tough. Sometimes we battled away for five hours (and five coffees and five hundred laughs – we had fun!) with my contribution to the German part, to begin with, consisting only of basic grammar structures and sometimes bringing something to read out aloud. My tandem’s English is of course much more advanced and in the English half we were already discussing similes and turns of phrase. 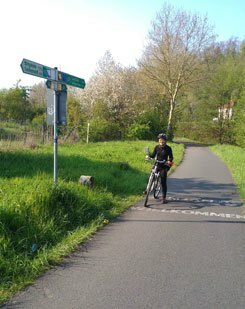 Being able to cycle across the border and back after work, along the Saar River was still a novelty after two years of living in Saarbrücken. Now I am more accustomed to crossing borders between languages as well as places! | © Carolyn Wu Having some knowledge of German has also meant that I am able to take part in extracurricular activities that I enjoy. Recently I joined the University Choir to take part in the classical music scene. The first couple of rehearsals were still intense in a language sense! We sing German texts - naturally a pronunciation challenge - and it was such a scramble just keeping up with the fast pace of the instructions in German. By the third rehearsal, though, things were much clearer. The intensity did not drop, but I kept up and could focus more on singing. I am ever so grateful and respectful that learning German has opened up these types of opportunities which make me feel settled in Germany and keep a well-rounded lifestyle so that everything stays – as the Germans say – “in the green range”. Joining a choir is a great way to meet people, practise German, and have fun! Some choirs don’t have an audition requirement – anyone is welcome, as long as you enjoy singing!